Saying it is somber on campus, well, thatâ€™s a given. We were already spent. We had enough last year and we didnâ€™t want anything else to happen. Now this? We werenâ€™t remotely prepared for this to happen. Most of us arenâ€™t capable of having any feeling anymore, so we donâ€™t know what to do. So weâ€™re just moving forward and weâ€™re going to do everything we can think of to remember and not let anyone forget that Joe was here. Itâ€™s easy to forget heâ€™s even gone. To me, Joe is in everything that is the school. So the fact that the buildings are still standing, means he is still here. The fact that I never met him and never will, sort of means thatâ€™s true. Last spring, I had my chance to meet him. I stopped by campus after school had ended. I came out of the business building and he was sitting on a bench, reading the paper. There was no one around, it was a moment when you realize that absence, and you realize how silent it is. I didnâ€™t say anything, I kept walking. I didnâ€™t want to disturb him. I wish I would have had the chance to meet him, but Iâ€™m ok with not saying anything that day. The symbols are everywhere. The hardest part of the day is the walk back to my car. I park next to the stadium and his picture has been on the north scoreboard for the past few days. You see it once to pass the IM building and I look at it all the way to my car. Across the street, the BJC sign just says, â€˜Thanks JoePaâ€™. On Sunday morning, I had to go to campus, I saw the line of cars at the statue and could see the crowd around it, there is still a line of cars there tonight. Yesterday afternoon, the traffic was backed up to the BJC, itâ€™s never like that. It wasnâ€™t really because everyone was stopping by the statue, but with all the media tents and people slowing down to look, it backed things up. I had another meeting to go to but it had been a hard day and I decided the meeting wasnâ€™t all that important. I dropped my stuff in my car and walked around the stadium. I stopped at the statue. There were maybe fifteen people there. Nobody said anything. People were just looking at the statue, looking at everything that had been left, or taking pictures, some people were just looking at the stadium. I kept walking around. The ground was still covered with snow and in the grass north of the stadium, which is on somewhat of a hill, people had written in the snow, I spotted â€˜We Areâ€™ and â€˜JoePaâ€™. Itâ€™s gone today now that everything has melted. The only wonder I have is if these are the sorts of things we should have been doing after he was fired. I know everything was happening so fast, and we still had games to play. Plus, everyone employed by the university was probably scared to show any support. Now, Iâ€™m sure most of what has been done just was, nobody worried. I probably wonâ€™t make it to the viewing, Iâ€™ve seen pictures of the lines. I will try and leave class early and cancel my office hours tomorrow for the send-off through campus. I was able to get a seat at the memorial, so I will be there in the BJC on Thursday. I donâ€™t know what that is going to be like, I donâ€™t imagine it will be easy. After that, I think it will be just as hard for a while. Iâ€™m not sure the mood will change until Blue-White, and Iâ€™m very curious what that will be like, it will probably be the first one I attend since my sophomore year. How do we continue to remember him? Besides the library. Does it become Paterno Stadium? 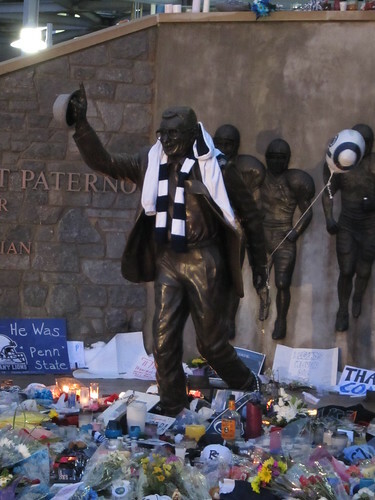 I think Old Main should become Paterno Hall, thatâ€™s how important he was to the school. My favorite idea Iâ€™ve seen is renaming State College to Joe. So that we can all live in Joe, PA. The few pictures I took on my walk yesterday are on flickr. Very cool video about the first students at Penn State. Includes the original Old Main (it was much bigger than I knew) and how it wasn’t finished when school started.